Despite all the crap Top Gear's both been through and put itself through, it appears the quickly greying juggernaut can not be stopped. 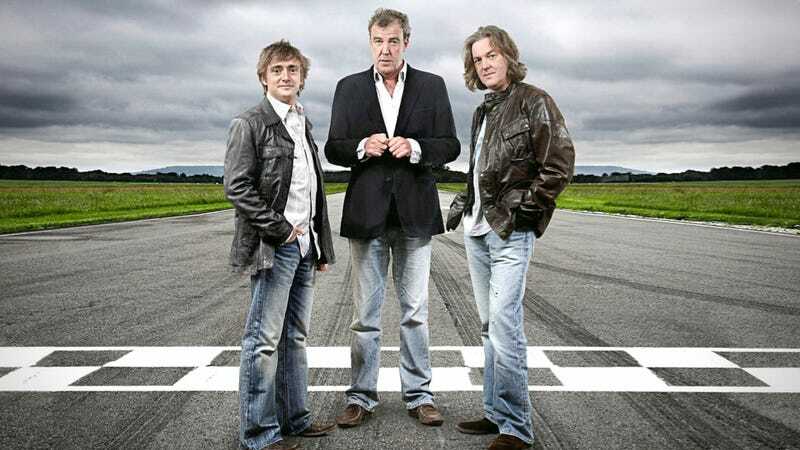 The Mirror reports that Jeremy Clarkson, James May, and Richard Hammond are all closing in on a three-year contract extension. Rejoice and/or bemoan, however you feel about it at this point. But whether or not you feel the controversies the show sometimes engenders are genuine, or sometimes crap, it doesn't look like it's going anywhere for the time being. Which is remarkable, considering that just a few months ago Clarkson was saying he'd be fired if he screwed up again. Asked if he should pull the plug on the "embarrassment", he told the Radio Times: "It's a programme loads of people love and it's important the BBC doesn't have just one voice." The trio should all be making a whole bunch of money, but do you really care the exact amount? It's likely going to be more than anyone should ever deserve for larking about with your mates, and you'll just watch it on the iPlayer through the Hola Chrome extension, anyways. Not that you should do that. I'm just saying, that's what SOME PEOPLE do.